You asked some great questions. I originally said I would just choose some of them to answer. But in the end I decided to answer them all. It took about 5 hours, so I hope you enjoy it. I certainly did. Congratulations guys, and if you send your address to amishamerica@gmail.com, I’ll get your books out lickety-split. And while I’m plugging things, I probably need to plug the book contest again–Success Made Simple is currently at #11. You can vote here (takes 6 seconds, one vote per day allowed)–in fact if everyone who reads this stops and votes right now, the book ought to rocket up to #7 or #6 even. Boy that would be pretty neat (the top 10 books win). 1. Marilyn asked: When Amish open a business, do they just “do it” or do they go and register properly with the permission of the government? Erik: Amish typically do things by the book, so would get the appropriate licenses, etc. As with non-Amish it’s not impossible that you might find someone doing small amounts of business off the books, but typically you are going to see Amish complying with whatever local laws there might be and paying required taxes (outside of certain religious exemptions, see below). 2. Csarina: I would love to know how long it took you to research the book. It was about a 2-year research process, with 6 or 7 separate visits to Lancaster County and Holmes County, Ohio. Also, when I was running my book business in Amish communities, you might consider this some informal “research”–I met a lot of business owners from Iowa to PA, and observed how their businesses operated, though I wasn’t yet doing formal interviews. 3. Suzanna Laitinen: When you were researching this book, you obviously had to interview alot of people. Was it hard to get everyone to be open and speak with you? Were they mostly people you already had some sort of relationship with? You are right Suzanna, I ended up interviewing five dozen entrepreneurs. To be honest, it wasn’t very hard to get people to share. The reason it wasn’t was because I had a pre-existing relationship with most of them, from doing business in their communities (I ran a book sales business, and many were my former customers). I also got recommendations from people I knew. I think I was turned down maybe 2 or 3 times. In terms of people speaking with me, it was generally pretty easy. Some entrepreneurs were naturally more quiet and less talkative, others went on and on. The longest interview was about 2 hours; a few of them I interviewed more than once. People took an interest; probably around 1/3 of the interviewees on finishing our talk said they wanted to read the book after it was finished. I actually recorded all interviews with a small handheld voice recorder built into my digital camera. No one I interviewed had any problem with that. This may go contrary to what we think of the Amish when it comes to recordings. Video taping would still be rejected by most Amish. But not voice recordings. I have since read some academic studies where researchers have stuck to handwritten notes because they felt any type of recording would be unacceptable, but for me this was simply not the case. I also wanted the most accurate rendition of what was said possible, and plus I can’t write that fast (or read half the stuff I scribble, for that matter)! If I can generalize a bit, I think that Amish business owners tend to be a bit more open and eager to speak about what they do–for one, most are used to a lot of interaction with the non-Amish public, and for two, business is an area more focused on the individual and personal achievement (which goes a bit counter to traditional Amish values, true). And also, the business topic is not really the most taboo or controversial–had I been doing a study on courtship practices or excommunication, it may have been more of a challenge. 4. Denise Flynn: What type of businesses do the Amish prefer to own? Amish primarily own businesses that are manual-labor or craftsmanship-oriented. Furniture companies, constructions firms, machine shops, engine repair, manufacturers, and particularly for women, crafts oriented businesses, such as quilts, are popular. Many of these businesses cater to the non-Amish market. There is a large segment of Amish-oriented enterprises though–buggy and harness shops, plain clothing and fabric sellers, suit makers, dry goods stores. But even there you get some surprises–for instance, the largest horse-drawn equipment maker in America, an Amish company in Ohio, actually sells about 1/3 of its product to non-Amish–often horse enthusiasts and hobby farmers. 5. Alice Aber: I am struggling to get my ceramics and crafts business up and running. One of the places I intend to sell my wares is actually in Arthur, IL which is an Amish community. What is the best piece of advice you could give me for marketing my wares in an Amish community? The first thing that comes to mind would be making sure the product appealed to the market. In this case, Amish consumers would traditionally appreciate things like good value for the money, durability, practicality, plainness. Decorations are less common in Amish homes, but if something fulfills a practical need and is decorative at the same time, that is more acceptable. An example would be calendars–they often feature beautiful images, but are more readily accepted than a decorative painting or picture would be, because a calendar has a practical use. Sometimes you wonder why Amish need so many calendars in their homes, but they are everywhere! 6. Elena: I would like to know what role do women play in the businesses. Do they work alongside their husbands, or do they remain at home, while their husbands work outside? Also: do the children help out with the businesses (for instance, do they help in the shops)? Amish women play a very important role in many Amish businesses. Some will chip in to help out with manual tasks. For instance, one wife sometimes gets up before dawn to work in the shop when her husband’s furniture company has a lot of orders to get out. Others will handle essential tasks like accounting and bookwork. Some Amish women own their own businesses as well. I discuss some of these in my book–quilt businesses, market stands, food businesses are common. And sometimes husbands even work in their wives’ companies. Children are important too–as in the excerpt I shared, Amish see it as key to teaching work ethic and important values. You’ll see little guys, 4 and 5 year olds, wanting to do something to help out–usually really easy tasks, but they see dad and brothers doing things, and they want to as well. Of course, children can’t do everything, and there are some laws restricting what they can do. 7. Loretta: Do the Amish ever consider their business to have become a failure and close or do they continue to struggle if it isn’t productive? Survival rates are high among Amish, but sometimes they do close. Amish have a process known as “trusteeship”, where a struggling business will be guided by 3 members of the community. They will essentially take over the business and either help nurse it back to health, or make decisions on whether it should be liquidated and how that should be handled. This happens sometimes, but is not too common. I personally know of a few that have closed in recent years, but it’s a minority. 8. Leanna Morris: How do the Amish stay competitive in todays “electronic world”? Is it difficult for them to be a sucessful at their enterprise? Good question Leanna–Amish have had to negotiate electronic media and technology, sometimes adapting it to be used in an acceptable way. Some Amish will have a web presence–sometimes a company website, or have their wares marketed online by a third party. Typically a third party is involved to operate a site and handle web orders. But some Amish do have internet access, for example through cell phones. Not accepted everywhere, and quite taboo in some communities, but you do see it in places like Lancaster and Holmes Counties. Not all Amish are online of course, and some wonder if they should be. A builder friend and I were recently mulling the question if it would be a good idea for him to get online. I could sense he felt he might be at a disadvantage by not having a web site. I don’t know how beneficial it would be in his particular business, but for many companies (furniture comes to mind), selling online is a big part of their business. 9. Heesa Phadie: While doing your research I’m sure you ate a lot of Amish food. What are the food stuffs that you consider to be to truly of the Amish? What are your favorites? Aha, a non-business question! Glad to take it. Heesa, here are my top picks: chipped-beef gravy, shoofly and milk, anything with Abe and Sarah’s tomatoes, my friend’s wife’s tinfoil-wrapped-to-go egg-and-mayo breakfast sandwiches, schmier kase, the famous Riehl McCoy sub sandwich, and of course Amish peanut butter on Sundays. Not scrapple though. And “truly of the Amish”–I’d have to defer to someone like Sherry Gore or Kevin Williams, but I would suspect this category would include the very traditional PA Dutch style foods like butter noodles, chow-chow, chicken pot pie, etc. But the Amish palate is definitely wider than the traditional PA Dutch menu. 10. Richard Stevick: Hi, Erik, How did you find your publisher, Jossey-Bass, a very respectable one indeed? Did you go through the query process like most normal writers? Good question Professor Stevick. I was not an abnormal writer so I did attempt the query process–sending one-page query letters to agents that I thought might find an interest in the book (if any writers out there want to employ this method, you can try guides like “Jeff Herman’s Guide to Book Publishers, Editors, and Literary Agents” for listings of agents and how to submit to them–each agent usually has a preferred format, and it’s smart to follow what they want!). In the end, a friend recommended that I contact an agent he had worked with before, and the agent turned out to have interest in what I was doing and thought Jossey-Bass would be a good fit. Also a pretty “normal” way to find a publisher, I guess! 11. Carol: Is it true that sometimes Amish businesses get “too successful” and get censured by a local bishop? Carol this is a question I had when I was doing research. Does an Amish business ever get “too big”? There have been instances where companies have grown “too large”, and have been compelled to sell off part or all of a business. But “too large” I found does not always mean size, sales turnover, or number of employees, but more the attitude of the owner. I can be “too large” with 2 employees, if my attitude and sense of importance becomes “too large”. Conversely I can operate a $10 million/year business, of which there are a number among the Amish, and not be “too large”. Maintaining humility is what’s important. 12. Connie: If you had to do it all over again, would you do anything differently? Connie, if I had to do it all over again, I would be born a pro athlete, so that I could make easy millions dunking a basketball. Wait, you probably mean to do with the book?? Well, if I had to do the book over again, I would probably try to attend an Amish-run business seminar. I interviewed a few people that run these and saw what was covered, but regrettably did not get a chance to sit in on one. 13. Nancye Davis: How much, if any, electricity is allowed to be used to run a business? What about the use of phones and or computers to aid in the every day running of the business? Amish typically use what Donald Kraybill refers to as “Amish electricity”–which isn’t really electricity at all, but pneumatic and hydraulic power used to operate equipment. More conservative Amish often don’t allow this though, and rely on diesel engines which turn long drive shafts running under the floor of the shop. A series of pulley bands arise from the shaft in the floor and provide power to the various pieces of equipment. Many Amish make use of batteries and inverters to convert 12V battery power to 110V, in order to operate things like cash registers. A few Amish such as “electric New Order” Amish permit some electricity, and you do see some allowances for electric lights, say in furniture finishing shops where a gas lamp (like most Amish use) would create a combustion hazard around the stains and finishing chemicals. 14. Gary Sloan: I was wondering how they decide what type of business to begin? And do they study the area and people around them to find out what some of the local needs are that they could meet through their business? Gary a lot of it is shaped by cultural, educational, and technological restraints–businesses that are morally offensive, require a certain level of formal education, or that use or deal in taboo technology, would automatically be off the list. So this is why you have a lot of manual labor/craftsmanship type companies. I asked this question of my interviewees, and some simply said that they noticed a need in the area, either because they themselves sought that product/service and it wasn’t available, or because someone in the community suggested it. Some communities, such as Arthur, Illinois (known for Amish-made furniture and Amish-built cabinets) develop a reputation for a particular industry, and attract outside consumers for that business, encouraging others to set up and cluster in the same area. Lancaster County has a high % of off-site market businesses–it is near large population centers (Baltimore, Philly, DC) and thus these consumer markets beckon Amish to establish PA Dutch-style vendor’s markets. 15. Patsy: I was wondering what made you start to write Amish books in the first place. Patsy I was fortunate to have the incomparable experience of selling Bible-oriented books in Amish communities over a number of years. Over that time I visited an estimated 5,000+ Amish homes. I’ve written more about the experience here and here. 16. Bibi: Do the Amish have to prepare their home made baked goods in certified kitchens or are they allowed to use their own home kitchens? Food prep rules have been controversial and I believe this varies by state. Recently when I visited the Amish community at Munfordville, Kentucky, I ran into a baked goods business that had been shut down. There have also been controversies over selling raw milk. 17. Rachael: I really enjoyed the sample from your book on the link site and from the above it looks as thought the rest of the book is just as interesting. How many family businesses feature in your book? Hi Rachael, I interviewed 60 business owners, but incorporate examples from outside this core group as well. Business owners include Ivan Miller, a plain clothing wholesaler; Alvin Hershberger, Ohio minister and furniture maker; quiltmaker Sadie Lapp, Elam Peachey, Harley Stutzman, and many others. 18. Mona Greer: Is there infidelity in the Amish and how do they handle that ? How would the other spouse marry again ? Mona, there probably is some. But I’d guess it to be pretty rare especially compared to non-Amish rates. Divorce among Amish is taboo, though separations occur occasionally. Widows and widowers can and do often remarry. 19. Diane Veness: Do the Amish have to pay taxes? Can they use power tools in their jobs? Diane, yes they do pay taxes, though there is a religious exemption for Social Security in recognition of the fact that they care for their own. You can read more here on Amish and taxes. Power tools are actually permitted for many Amish home builders when they are working on a job site away from their home area. They would tap into the public grid in this case. This is done from practical need. But they wouldn’t use public electric on their own property. 20. Liz: What inspired you to begin this writing project? Kind of goes with What inspired you to begin research of the Amish? 21. Miodrag Silobad: What do you think are two most important lessons (principles) that today managers in USA and around the world should learn from Amish people? Humble leadership. Amish bosses stress doing the “dirty work” from time to time. Getting involved on the level of employees sends a message that you don’t see yourself as too big to do a particular job. Amish managers tend to be hands-on, working alongside their employees, rather than delivering orders from a distant office. Amish employees notice when the boss pitches in—even when it is just a small job—and this helps with the productivity and longevity they get out of their employees. Every company, Amish or non-Amish, has its “dirty work”. Bosses have numerous opportunities to humble themselves, and those that do send an important message to their workers—communicating by their actions in ways that words cannot. Family. Family is important outside of the business, and to a degree within it. As a family-oriented society, Amish tend to be very aware that workers are parents and spouses before they are workers. Amish orient their compensation towards this—providing family picnics as fringe benefits, for example. Amish also seek to foster a family environment within the business. This may be easier for the Amish, since often employees actually do include family, but even with outsiders, Amish generally seek to be inclusive. This cultural attitude also affects their business worldview and decisions they make. In my book I describe a landscaper who boosted his payroll from 3 employees to 9. Describing the additional responsibility, he says he now has 9 families to feed. Seeing your workers in that light, rather than as a disposable input, makes you consider the implications of your business decisions more carefully. I think this orientation helps the Amish be more conservative in their business decisions, which can ultimately help them, especially during times of economic slowdown and crisis. And of course, employees appreciate this on the human level as well. 22. Mike: When did it occur to you that you could make more money by publishing a book with the word “Amish” on the cover, than you could by selling Bible story books door to door to the Amish? 23. Gail Dawson: My question is this: how has the current recession affected — or not affected — Amish businesses? Gail, good question–I think I might refer you to a post on Amish and the recession from a bit earlier in the year. 24. Karen Gervais: Do the Amish have to get a license from the state they are in to have a business and what about liability insurance? Amish are typically going to abide by local rules and regulations. However they do have religious exemptions for certain forms of insurance such as workman’s comp. Of course, Amish take on financial burdens to pay for many things out of pocket (ie cash bills for medical care for injured employees), which non-Amish wouldn’t. Some Amish have also formed Amish-run liability insurance programs, operated by the community. A good blog post I recently read addressing this issue is here. 25. Marianne Kukec: Can you tell me why I never see Amish riding horseback? Marianne, I believe it is due to culture–it is just not a commonly-accepted form of travel. Horseback riding is connected with recreation more than practicality, which I believe factors into it as Amish would tend to favor things that are practical over things done just for fun. That said, you do occasionally see Amish on horseback. 26. Kristie Donelson: Do Amish women own many businesses? Outside the home? What kind? Kristie, they do–in one study Donald Kraybill and Steven Nolt found that Amish women operate nearly 20% of the Amish businesses in Lancaster County. I am not sure that that high of a percentage would apply in all Amish communities, but you do see women running small businesses often enough. Quilts, food and flower stands, and crafts businesses are popular among Amish women. 27. Kate: My question to you is about writing a book. I’ve been told many times that I should share my story through a book but I have NO idea how to get started. So, how did YOU start your book? What were the 1st few steps? Kate, first was the idea. This struck me one day when I was out for a run after returning from selling books in Northern Indiana. Secondly, I think you have to be really committed and motivated by the idea of creating and producing something meaningful. It has to mean something to you, because it is a big enough challenge that you can become discouraged, and if you don’t have a strong motivation, it’s easy to want to quit. So that is another way of saying have a good idea that you believe in. I was curious about what I would learn, and thought the book could be beneficial. As I did research and learned more, this motivated me more and more, and it built upon itself. Small steps are important, as is setting goals, just as in any other project. 28. Karen Pollard: I’ve often wondered if the Amish pay sales tax or income tax. Do you know? We actually got a similar question above–they do pay both, and numerous others with the exception of Social Security. You can read more here on taxes and the Amish. 29. Marcus Yoder: I have many Amish cousins, that own successful businesses. How did you find, and figure out which Amish to interview? Marcus fortunately I had made a lot of connections when I worked selling books in Amish communities. A lot of the businesses I approached were former customers. I probably had 300-400 business owners alone who had bought books from me. So I tried to approach a variety which was representative of Amish businesses–some small, some large, different industries, etc. I also got recommendations from some. 30. Loretta Shumpert: About 15 years ago, my husband and I went to the Marion/Matoon area of Kentucky and rode the back woods. We stopped at a house that also had a greenhouse and bought a bunch of mums. Brought them back to SC and set them out, and they lived for several years! It was a fairly new settlement then, did you do any research for that area? Loretta, I did not. I’ve heard this is a nice area. My primary research was in Lancaster County, and Holmes County, Ohio, the two largest and arguably most entrepreneurial settlements. However I incorporated other communities in the book as well. I recently visited Kentucky Amish communities for the first time. 31. Jackie Porter: When the Amish start a business at home do the children help with business? If so, at what age? Jackie, they often do–Amish value their children’s help, not only for the practical assistance, but for what the sheer work teaches their children. They maybe given small tasks at even a few years of age–more to help them get used to the idea of work. They will gradually learn to handle other parts of a business such as operating machinery or handling customers as they get older. 32. Kirk Martin: I worked with an Amish fellow this past summer putting a metal roof on my son-in-law’s house. In conversation with him I found out he was actually running 3 different companies – a roofing contractor, a roofing supplier, and a bow-hunting supply store. Is having multiple businesses typical or unique? Kirk, you actually see this fairly often–Amish will have their hands in a number of things. I think I’d put it down to a general entrepreneurial spirit, a lot of available hands, and creative spirit as well. One entrepreneur does house painting and furniture finishing. Another was running a plain clothing wholesale business, a buggy safety lights business, and a small woodshop making birdhouses (which his son helped operate). The son, who lives at home, also has a rare bird breeding business. While the majority are doing just one business, but it’s not uncommon to see those with at least a couple. 33. 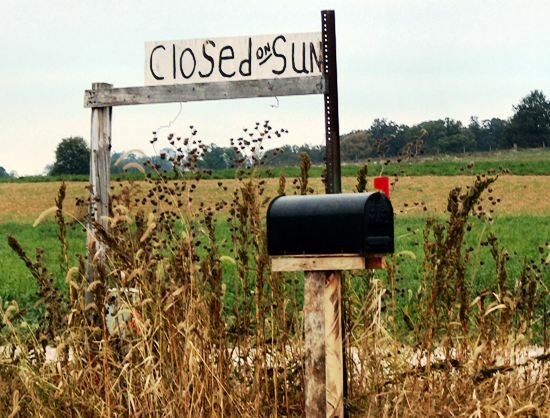 Matthew: How does debt play a role in Amish opening a small business? Are they likely to get a loan from the community, or do they get loans from a bank like the English? How many businesses start debt free, just funding as they go from the family savings? Debt is a useful tool and one Amish tend to use wisely. You’ll have commercial bank loans pretty often, but also lending within the community. Lending start-up capital to fledgling businesses in the community is one way successful entrepreneurs use their money. A lot of Amish I asked felt it was important to start without debt though. I think it often comes down to the comfort level and orientation of the individual. 34. Sherry Gore: When does your next book come out? A lot of folks will be looking for it! Gee, that’s a nice thought Sherry! Actually, I haven’t said much about it on the blog yet, but do have another book in the works. Right now, I will just say that it is about the Amish, non-fiction (but not a business book, one for a more general audience), and one that I think people will really enjoy. I’m writing it right now, and am very excited about it. It will be out in the spring, more info on this mysterious book to come soon. 35. Jones: I have read that some Anabaptists do not work (or encourage work) in businesses that do not meet a need or that do not produce products that are not necessities – i.e. a lot of retail. Have you found this to be true in the Amish community as well? There is some truth to the philosophy of not producing goods that are not essential, to the extent that most Amish businesses produce things that have some sort of practical use. However the interpretation of acceptable practical use would differ between Amish and non-Amish–Amish wouldn’t need a computer desk or in most cases a recreational vehicle, but many Amish work to produce both of these for English markets. Some Amish businesses produce wooden toys and play sets. These are not necessities but are not harmful or immoral. 36. RaDonna Murner: My question is what percentage of Amish businesses fail? Do they have the same failure rate as the rest of us do? Research done with Donald Kraybill and Steven Nolt suggests that over 90% of Amish businesses survive five years. The non-Amish business survival rate is around half that, according to the Small Business Administration. 37. Jonna E. Marsh: How long does it take to make an adult size bent wood rocker? Jonna, good question. I am trying to recall what my hickory rocker acquaintances have told me. Is it a day’s worth of man-hours, maybe? I am just guessing here, maybe someone that is better informed can answer in the comments. 38. Heidi: I too am wondering about whether the Amish borrow money to start their business and how often do they fail?? I am trying to get my business off the ground without borrowing money! Heidi, see questions #33, and #36 above! 39. Kathy Rowe: What is the one tried and true rule for the Amish to run a successful business? Kathy, I don’t know if there is one tried and true rule. If we had to boil it down, we might say “Do unto others”. I do talk about where the Amish get their inspiration, and how many feel the Bible includes a lot of “business advice”. In fact, one Amishman I quote in my book says that “marketing is actually the book of Proverbs”. See also question #21. 40. Laura Smith: How did you become interested enough in the Amish to study them and their ways? Hi Laura, I think I hit on this one already, I’m going to point you up to question #15. 41. Bobbe’ Hadley: Do you feel your book would be a great influence on those who are not Amish but do admire the simpler way of working and living? And if so how would they benefit from reading your wonderful book? Wow Bobbe’, thanks for such a warm description! I would hope it would be a positive influence. If I had to boil it down, the book is really about getting back to basics, and also understanding what success means. Success can have different definitions. Amish have different definitions–some financial, many are often to do with family, giving back, mentorship, and even pursuing a passion. But sometimes even Amish lose track of what’s most important. 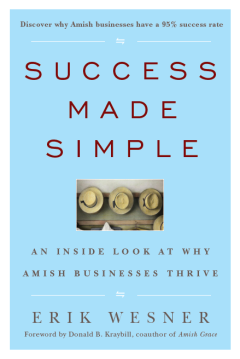 I share a brief story in the Epilogue of the book (“Barn-raising”), in which I share how one Amish entrepreneur remembered what matters most after an unexpected event in his life. 42. Brian Hanley: I’m curious what the Amish think about biotech businesses and genetic engineering for four categories. – Animal modifications: Cloning of animals, modification of animal genes to produce drugs, special proteins for medications, enhancement of strength, size, milk production, etc. Also, gene therapy for animals to combat disease, enhance growth rate, increase milk production. – Human modifications: Cloning, modification of germline to remove genetic diseases; modifications of germline to omprove strength, intelligence, etc. – Human therapeutics: Gene therapy to treat illness or improve health. Gene therapy to increase strength, speed and endurance. Wow Brian, you win the unofficial award for longest/most difficult-to-answer question. I have to limit my answer here to asking if you’d mind if I took a pass? I’m not sure I’m too qualified to answer this one–Apologies! 43. Maggie Thornton: How long does it take an Amish business after it is opened to know if it is going to be on going? Good question Maggie. Some business people I spoke with felt it was a 1-3 year “hump” to get over. After about 3 years you ought to have a good sense of where you stand. Of course that can vary. And some find out a lot sooner, I suspect. 44. Heide: Did you allow the Amish you wrote about to read your book or parts of it before you published it — given their sensitivites? Did anyone ask you to change anything or protect them in any way? To be honest, I think in most cases I probably could have even left all real names in there without much of a problem. Business is just not that controversial a topic, though of course having your real name appear in a publication like this one may expose you to accusations of pride. So in the end it’s probably good I did it this way, but I don’t think it would have been a huge deal. 45. Donna Shelton: Did you actually go to some of their businesses? Many of them Donna! If I had to guess, I’ve probably been in/at around 1000 Amish companies, though I focused my interviews on a smaller subgroup. 46. Michelle V: My question (not feelin’ too creative): Do Amish business owners believe in or utilize CPA’s(accountants)? Michelle not a bad question–they definitely do, and in fact, in many communities Amish themselves provide this business service. In my book I actually interview 2 Amish accountants, Bishop Isaac Smoker in Lancaster, and another in Ohio, who spent a number of years honing his craft while working at H&R Block, if you can believe it. 47. Janet Rader: How do the Amish decide what type of business to start, and do they receive small business loans for start ups? Janet, for part 1 of your question, check out question #14 above, and for part 2, try question #33. 48. JoEllen McNeil: How are you able to interview so many Amish business owners when most do not like to discuss details of their lives with us “Englishers”? Or is this a misnomer? Hi JoEllen, I’ll partially answer this and partially refer you up to question #3 above. I do believe it is more a misnomer than truth, though there is no doubt some truth to it. Like with anyone else, it helps if you have a relationship with somebody, and they understand your intentions. A business book project I found was naturally appealing to many people I approached, because there is a natural curiosity there, and businesspeople by their nature typically strive to get better at what they do, so something examining how business works can be seen as useful. I actually had quite a few stop and think through things they had never really given much thought to before. Some Amish may be more reluctant to share with outsiders–I am thinking more conservative groups–but the Amish I interviewed were mostly from the “mainstream”. 49. Juan Carlos: How much of the text you write gets changed a bit by the publisher/editor? What do you do when you feel strongly and really like how you phrased/worded a sentence, and whomever reviews the manuscript thinks it should read differently? How did you decide on the title of the book? What other titles were you considering? Juan Carlos, in my case, surprisingly little was changed. Which I thought was great! The editorial team at Jossey-Bass was super in that they trusted I knew what I was talking about on the substance. The stylistic changes they suggested I thought were all valid and good. So it was a great partnership. I know some writers “fall in love” with a particular turn of phrase or sentence, but I don’t belong to that group. So I was okay with suggested changes. The title decision is a collaborative process. My original choice for title was The Amish CEO. 50. Vicki: I wonder if any Amish ever engage in any shady business practices or in businesses that might not always look to be ethically sound? Vicki, I’m sure it happens, as there are bad apples in every bunch. Generally though, Amish business owners are trustworthy and genuinely try to live the “Do Unto Others” creed, which means applying it in all areas of life, including business. Though again, no one is perfect. 51. Brett: Can you give examples of some Amish businesses that you know of that seems the least “Amish”, like an Amishman owning a bar or pub. They generally wouldn’t own or participate in morally objectionable businesses, such as gambling, tattoo parlors, or alcohol sales. But let’s see what comes to mind…there are some race-horse trainers, maybe businesses that produce luxury furniture (one business makes a bedframe that costs over $10,000, called the “Manhattan”) or auctioneers–though they are fairly common, the idea of an Amish auctioneer “performing” on stage still strikes me as somehow “un-Amish”. Oh yeah, here is another I just recalled. 52. Elizabeth: I approach my career as an employee as my own business. I manage my business plan with basic mission, objectives and goals. I have found this to be a successful plan that has worked for me, even when my personal professional goals differ somewhat from my employers. I was wondering if successful Amish businesses develop written plans and how they manage it when the growth of the business is dependent on deviation from their goals? You know Elizabeth, just as among non-Amish, I think you see different approaches. I asked about this in my interviews, and you do have the methodical types that analyze everything before jumping in, and then you also have the attitude of “let’s start up and see where it takes us”. Starting with little or no debt, as a side business while keeping a day job, helps Amish cut down on risk though. If I had to guess, I would suspect that the second approach is more common. 53. Anita: I’m not sure if you’ve answered this on the site earlier- I’ve been following for quite awhile now. I’m really curious how you ended up researching Amish. What drew you to them? Hey Anita, this has been a popular question today! Let me shoot you up to question #15 to find an answer. 54. Mary Essary: My question is do Amish people ONLY work with their families or other Amish when it comes to their business? Do they ever employ people from outside? Mary Amish do employ outsiders, though the majority of the payroll is going to be Amish. Working with fellow Amish, you have similarities in language, cultural values, church holidays, and a number of other factors lining up, so it just makes sense. But Amish do hire outsiders, often as drivers, but sometimes to work in “regular positions” in their firms as well. And that’s it folks! Get your Success Made Simple stocking stuffers here. Vote for the book here. Back to regularly scheduled programming Monday! Thanks Erik! I plan on making very basic ceramics, utilitarian ware such as dishes, mixing bowls, coffee cups, salt and pepper shakers. Just about anything you could use for the kitchen or bathroom. I planned on keeping primarily plan and simple colors down in Arthur. I also hand dip beeswax candles and make home made soaps. There is most definitely a lot of reading here. I love it!! I will be sitting down later after I get a few chores done to read it all. Thanks so much for all your input, it is awesome!! Come on everyone, we need to remember to vote for Erik’s book every day. Only 5 days left. It would be so cool to see him win!! Just click on the link at the top of the page and go vote for Success Made Simple!! Thanks, Erik. I’m about half way thru your book and am saddened when I have to stop reading each day. I have read many books about the Amish and it is refreshing to read one that explains an aspect of their lives that has not been so apparent in other writings and wonderfully done, I must add! I am thrilled to hear you will have another book about the Amish for us to enjoy. Do you have an idea of how long it will be before it will be available? Best of luck to you! Thankyou for answering everyone’s questions. I have enjoyed reading them all. This has been awesome to read Erik, thanks for answering all these questions!! Must say that you did overtime here on these questions. From my many years of experience with the Amish, you pretty well get the details right. I actually figured you’d skip my question, I confess it was just a grab at a free book, of course. You were probably the one that stopped at my place a few years back near Maple Valley Fence south of Charm, trying to peddle me the Bible Story books. You (If it was you) pulled out this list of all my neighbors and showed me how many had bought the set(seemed about 75%), and all the recommendations from them. I must admit, when you pulled away I really doubted that that many of my neighbors had really bought a set and recommended it. Good morning everyone!! Erik has slpped down to 12th place in the book contest. Please, please keep voting for him there are only a few days left. He does an awesome job on this blog, the least we can do is go vote for his book everyday. Together, we can push him back up in the ratings. He has to be within the top 10 to win. Sounds like that probably wasn’t me that visited you, but I am glad you’ve found what I wrote worthwhile anyway. And, no need to hold your breath on the romance books. I actually couldn’t tell you the last fiction book of any genre I’ve read. Not that I have any problem with fiction, just not really my area of interest. However, the rise in popularity of Amish-theme fiction is interesting in its own way. I am about 40 votes out of 10th place right now, and if it doesn’t make the top 10, I am perfectly fine with that–to be honest I think I just get a kick out of contests, and this one has turned out to be a lot of fun 😉 But thank you again, and will still be trying to crack into the winner’s circle by Wednesday. Lisa, I am glad you enjoyed the questions, it was truly a lot of fun for me as well. And Karen, that is one of the kindest things I’ve heard anyone say about the book–a huge thank you to you, made my day. On the new book, release date is not set in stone but is looking like early-mid spring. Will be sharing some more details once we get into the new year! Hi Erik, I guess I got so excited about wanting to see you win I MIGHT have gotten a little pushy. But if I have offended anyone I sure am sorry. I will shut up about it, LOL. Well,,,,,, maybe, LOL Just kidding! No no, that’s not what I meant at all Alice, you didn’t offend anyone–I’ve been plugging away myself 🙂 Thanks for helping out and we’ll see how things stand Wednesday.